Offering an outdoor pool and a fitness centre, BON Hotel Delta (Formerly Protea Hotel Ekpan) is located at Km 3 Nigerian Port Authority (N.P.A) Expressway, Ekpan Warri, Delta State, Nigeria. This hotel offers accommodation for both business and leisure travellers. It boasts a business centre, an elevator, and free Wi-Fi access. The well-decorated rooms are air conditioned. 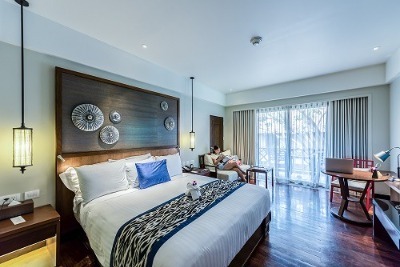 Each room is furnished with fridge, mini sitting area, ornate lampshade, intercom systems, flat screen cable connected television set and king-size bed. The en-suite bathroom is equipped with complimentary toiletries and a bathtub. Fully equipped kitchen is exclusive to some rooms. The rooms available in the hotel can be categorised into the Studio Room, Standard Classic, Standard Deluxe, Classic Suite, Executive Suite, and Self-Catering. Breakfast is served daily at no extra cost. Continental dishes, local Nigerian dishes, and Chinese Cuisines are available at the restaurant. The on-site bar is well stocked with assorted wines, juice, and other beverages. Guests can enjoy workout and swimming sessions at the Gym and Pool respectively. The conference facility can be rented for small corporate gathering. Laundry, airport pickup, and car hire services are available. On-site parking space is ample and CCTV cameras are put in place to ensure security. ATM is available on-site. Children- kids are welcome to stay at an extra cost. Q: Does BON Hotel Delta offer free Wi-Fi? Q: Does BON Hotel Delta have a swimming pool? Q: Does BON Hotel Delta offer complimentary breakfast? A: It offers complimentary breakfast. Q: Is there a fitness centre/gym at BON Hotel Delta? A: There is a fitness centre/gym at BON Hotel Delta. Q: Does BON Hotel Delta have a restaurant? Q: Does BON Hotel Delta have on-site parking? Is it free? Q: Does BON Hotel Delta airport pickup or shuttle services? A: Yes. It offers airport pick-up/shuttle services. BON Hotel Delta (Formerly Protea Hotel Ekpan) is a top-class hotel in Warri, Delta. Protea Hotel Warri is a beautiful place. The environment is neat. The staff are very efficient. Their facilities are of good standard and they are well organised. In a nutshell, I loved my stay at the Hotel and look forward to staying there some other time. I enjoyed myself, three great nights with all my needs been met, the receptionist was very nice and friendly and the place was neat. I went for hanging out with my friends to swimming and eating home made food, I must confess your hotel is great but there was a little problem with the toilet in my room, the water stopped rushing at first and later the WC also had some issue, but it was later fixed which was nice, great place. I really enjoyed my stay at your hotel. Friendly staff and a beautiful environment. I had a peaceful stay. I really love the hotel. Everything went well. There is 24-hour electricity, the internet was fast and the food was great. I was very impressed. I had a pleasant stay at the hotel. I enjoy the meal also, I had black soup for the first time ever while I was there and it was awesome. I really enjoyed my stay at the hotel. My stay at the hotel was an enjoyable one that I had to extend it. The hotel management and staff were warm and hospitable. The hotel had a very calm and clean environment with a cool atmosphere. The room was attractive and homely. It was also easy locating the hotel. Have nice pictures of BON Hotel Delta (Formerly Protea Hotel Ekpan)?